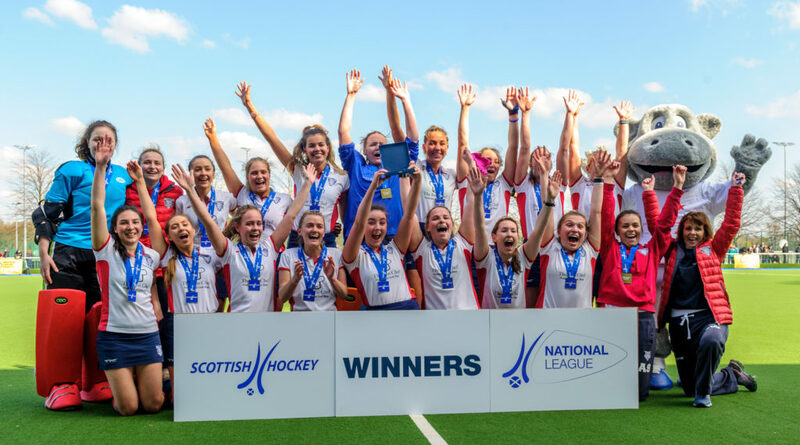 A tremendous day of hockey saw some big performances and big wins at the Grand Finals in Glasgow. Western Wildcats made club history by winning the women’s final, in their first ever appearance, and qualified for Europe for the first time in the club’s history. Grange men were victorious in the men’s Grand Final, avenging previous defeats to Grove Menzieshill. 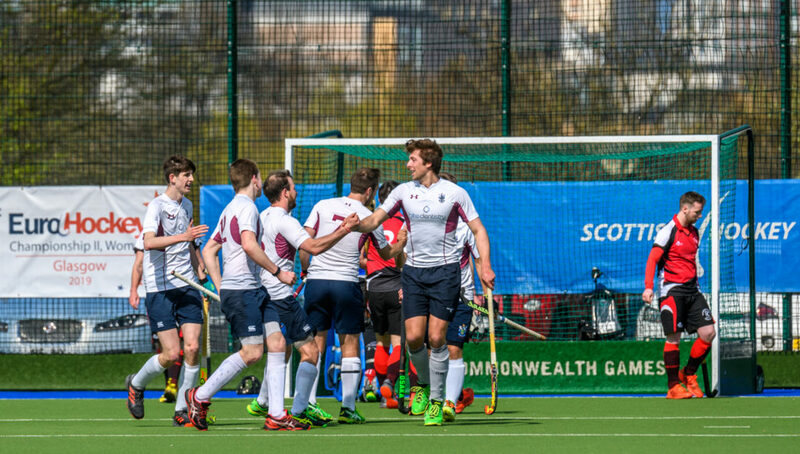 Menawhile Glasgow University and Watsonians avoided relegation and will compete in National League 1 next season. It was a historic day for Western Wildcats women as they defeated Clydesdale Western 2-0 in the Grand Finals and qualified for Europe for the first time in their history. It was an even opening to the contest. Long passes by Kaz Cuthbert for Western Wildcats were cutting through the Clydesdale Western defence, but didn’t lead to anything in the early stages. Up the other end of the pitch and a Fran Lonergan penalty corner for Clydesdale Western was well defended and cleared. 13 April 2019 at the National Hockey Centre, Glasgow Green. Scottish Hockey Grand Finals day. Then in a swift Western Wildcats break, the deadlock was broken. Heather Aitken ran through on goal and slipped the ball under Jess Buchanan in goal to make it 1-0 to Western Wildcats. It was a half that saw Western Wildcats edge the play and put in an excellent performance. Buchanan in goal for Clydesdale Western made a number of good saves to keep the score at 1-0. In the second half the game tore from end to end in the early stages but it was Wildcats who struck next. A well-executed penalty corner saw Kate Holmes fizz a pass for Megan Cox to deflect the ball into the roof of the net for 2-0. Western Wildcats were looking really strong and took the game to their opponents. Aitken nearly scored her second after she took in another defence splitting pass and ran into the Clydesdale Western D, but her powerful shot zipped just past the post. Emma McGregor had a great chance to pull one back for Clydesdale Western but her reverse shot looped wide of the mark. Western Wildcats just seemed to improve the longer the game went on and looked comfortable as they ran out winners in their first Grand Final, and qualified for Europe for the first time in their history. An exceptional performance by Grange saw them victorious in the Men’s Grand Final at the Glasgow National Hockey Centre. It was a quick as a flash early strike that separated the sides in the early stages as Grange took an early lead. The ball was fizzed across goal and Frank Ryan was waiting at the far post to finish clinically. 1-0. As the contest continued it was a tight affair with neither side creating any clear chances for a strike. The majority of the play was down the centre of the pitch and both teams cancelling each other out. Grange then doubled their advantage through a very composed finish. Dylan Bean absolutely smashed the ball against the back board to make it 2-0, and comfortable for Grange. The second goal saw Grange move firmly into their stride. Some excellent last gasp Grove Menzieshill tackling denied James Nairn and Duncan Riddell as Grange pressed for a third before half time. An excellent save by Paul Martin on the line denied Dan Coultas from a penalty corner that was arrowing towards the top left corner. Then right before half time Grove Menzieshill’s Aiden McQuade was denied at a penalty corner by a low save. Into the second half and right after the restart Grange hit Grove Menzieshill with a third goal. An attack down the left saw Alan Johnston come close before the ball fell kindly for John McCluskey to finish. 3-0. Grove Menzieshill fashioned a good opportunity from a penalty corner by Cameron Golden but he was denied by a solid save. As the game crept to a conclusion Grove Menzieshill went to kicking back as they went searching for goal. They couldn’t make the pressure count and it was Grange who would score again. McCluskey bagged a second goal on a quick break and he rolled the ball unchallenged into the empty goal for 4-0. It was a big win and a big performance for Grange who lifted another trophy with Grand Finals success. 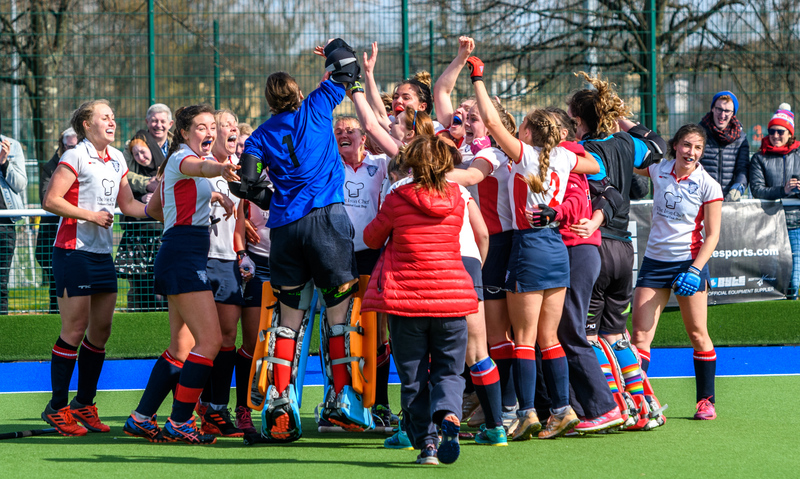 Glasgow University retained their Women’s National League 1 status with a great 4-1 victory over ESM at the Grand Finals in Glasgow. It was a scrappy opening to the contest with both sides looking nervy with so much at stake. The game’s first opportunity came from a quick ESM break but the Glasgow University defence was quick and resolute to defend well. As the first half progressed Glasgow University started to pressurise the ESM defence. Vikki Hanson in goal for ESM made a number of excellent saves to keep her side in the contest. Many from open play before a great double stop from a penalty corner. It was early in the second half that Glasgow University opened the scoring. A powerful and composed finish saw the ball slam against the back board to make it 1-0. 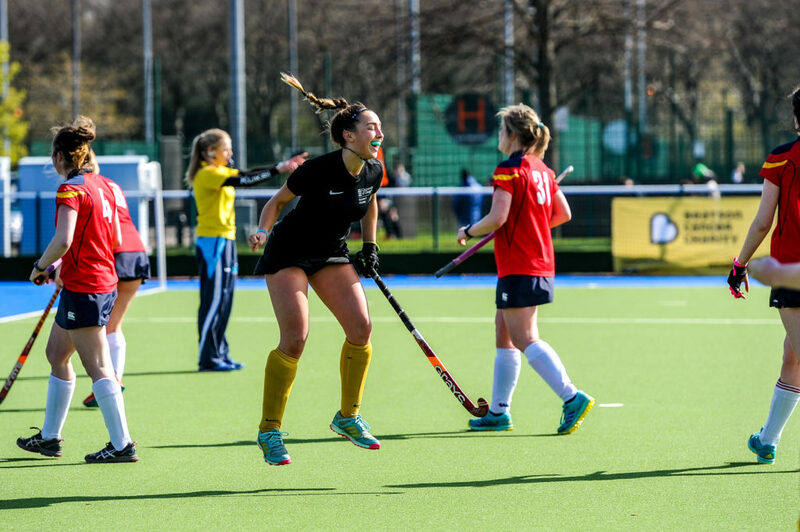 Connie Lathe scored the second for Glasgow University with a lovely finish. From a tight angle she lifted the ball over the diving goalkeeper into the far corner of the net for 2-0. It went to 3-0 for Glasgow University when Lucy Jamieson scored to put the game out of reach. ESM bagged a well-earned goal as the match neared a conclusion with a close-range finish by Sophie Spedding. She popped up at the far post to tap the ball home for 3-1. A lovely low finish across the goalkeeper by Glasgow University’s Laura Murray completed the scoring to make it 4-1 right before full time to seal the victory, and retain Glasgow University’s place in National League 1. A big 3-0 for Watsonians saw them retain their position in Men’s National League 1 for next season. There was an early goal for Watsonians to settle their nerves in the National League 1 side. It was an excellent strike on the turn by Fraser Heigh in the D to convert the early strike for 1-0. Carnegie came close to bagging a quick equaliser through a couple of penalty corner opportunities, but one was well blocked and the other zipped just wide. It was a physical contest as the game continued. Watsonians had a little more cutting edge about their play but Carnegie were battling hard and crashing some dangerous passes into the D.
Watsonians created a great opportunity as half time approached but were unable to force the ball home from close range. Watsonians nearly scored a second early in the second half but a tremendous diving block by a defender on the line prevented the goal. It went to 2-0 when Heigh bagged his second of the contest with a lovely reverse shot into the roof of the net to put his team into a comfortable lead. It was very nearly a hat trick for Heigh just moments later when he was sent running through on goal but a good block by the goalkeeper denied him. A big penalty corner that battered off the back board saw Danny Cain score a third for Watsonians with eleven minutes remaining. Carnegie charged forward to try and pull one back it the day belonged to Watsonians and they’ll play in Men’s National League 1 next season. The curtain falls on the Scottish Hockey domestic season at one of the highlights of Scotland’s sporting calendar – the Scottish Cup Finals!